The International Hunters Education Association reported that there are 300-500 hunters killed and almost 6000 are injured in tree stand accidents. Many of the tree stand accidents happen when the hunter is climbing or exiting the stand. Many also fall from their stands when falling asleep in their stand and are not using a safety strap. Every hunter wants to return “SAFELY” from every hunt. An old friend once told me to always kiss your family and loved ones before heading afield. “Give your wife a hug before you leave!’, he would always say. One of his old hunting buddies was in a hurry, on his way to camp, and left in a lurch. Halfway to camp, he fell asleep at the wheel and wrecked. He was killed, and his family’s last memory was a ranting and raving Dad in a hurry. No critter is worth dying over. Hunters hunt mainly for sport and not food. Store bought meat is way cheaper than wild game. There is no point risking or wasting your life over a day afield. Here are some tips to remind you to stay safe this hunting season. Beginner Safety Understand that hunting involves weapons, knives, and takes place in risky places. Ask a lot of questions. Find a Mentor to show you the ropes. Skills come from experience and education. Once you have taken a Hunters Safety Course, you need to practice what you learned. Your goal is to be a safe, ethical, and honest hunter. Know the rules, limits, and laws so you can be a good sport. Hunters Safety Being outdoors is risky. Many of us have hunted a lifetime without injury but we all have stories of close calls and other hunting accidents. Alcohol has NO place when hunting. It is hard enough to hunt safely with a clear head. If your hunting buddy starts drinking booze, you lose! Too much booze in the evening will leave a hungover companion. Not a good idea. Hunt wit a clear head so you can use all your senses. Tree stands can be an accident waiting to happen. Placing the stand into a tree is riskier since no safety straps or tie downs are secure. Take your time and have a friend spot and support you. Once the stand is in place, use your safety strap when ascending and descending. Secure the strap when in the stand. The best safety straps are designed as a full torso harness that will support your body. 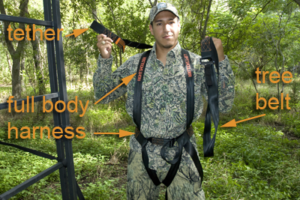 Hunters have died from falling and being suspended by their improper straps. Single loop straps or improperly fitted straps will cut off circulation. Once the hunter goes into shock, it is too late. Practice using your stand and identify the trees best suited for your style or brand of stand. Weather multiplies risks and danger. Setting a tree stand in a wet or icy tree is always slippery. Temperature changes cause hypothermia and add to the risks. Many hunters get hit by lightening strikes, when in a tree stand. Always let your family and friends know where you will be hunting. Leave some identification and a note, or map in your vehicle. Cell phones do not always work well in the places we hunt. If they do, keep it on your person. It will do no good in your pack if you become separated. Know your weapon. Understand the safety features and dangerous concerns. Identify your target before shooting. Never scope other hunters. Use binoculars. Wear legal safety clothes as prescribed by law. Florescent orange hats and vests are often required. I often take off my hat when in a stand but always leave on the vest. Hats are always moving as we search for critters and the movement can give away your position. If in bear country, carry bear spray or a proper handgun. Have it on your person, not in your pack. When bait is involved, all species come to the buffet. A bear, wolf, or mountain lion can ruin your day. A small first aid kit is a good idea. A few band aids, gauze bandages, tape, aspirin, and other personal health items are a good idea. If you plan for a problem, you usually avoid it. When dressing the critters, take your time. Wear sanitary gloves and always cut away from your body. A slipped sharp edge can quickly become a fatal issue. Archery hunters need to be aware of their super sharp broadheads. Never stalk with a loaded arrow. One slip can impale you. Proper boots and gear will help keep you safe. Traction treads and fitted socks, will give you a sturdy and sure step. Shooting glasses will protect your eyes and improve your visibility. Hats keep the heat from leaving your body. Many Hypothermia issues happen over 75 degrees! Dehydration will also lead to cramps and heat stroke. When in your tree stand, move your body slowly. Staying completely still will deter circulation and can cause numbness. Cramping in a tree, 20 feet up, can be a huge problem. Make sure you hydrate and eat energy snacks. Wearing compression fitted garments keep you warm and promote circulation. If your safety strap is adjusted properly, you can stand and swing slightly out from the tree allowing the strap to support you. Non-hunters need to be aware when afield. Hunters only have a few weeks or months afield, so allow hunters to enjoy their time. Avoid interfering with a legal hunt or stand. You to should wear bright colored safety clothing and hats. Wear a bell or be certain to make noise. Dogs and pets can be at risk too. Pay attention to hunting seasons and consider walking in areas where hunting is restricted. The hunter returning home safely from the field is a good thing. We want to hunt another day. Make sure that you practice safe hunting and are a student of the sport. Share your tips, experiences, and training with others. Spend your time afield hunting and not giving first aid to others. 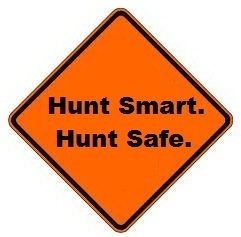 Prevention is the first step of safe hunting! For more Montana Grant, find him warm and safe at www.montanagrantfishing.com.